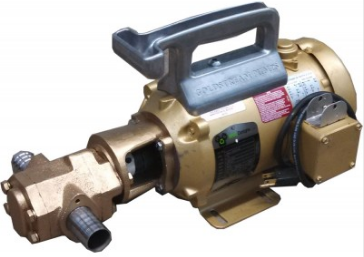 Goldstream Portable Gear Pumps for Oils 75 lpm, Cast Iron, Max 200 Celcius - Welcome to Oilybits U.K. Robust, and reliable Portable Gear Pumps for transferring viscous oils between containers. We recommend this type of pump where liquid of medium to high viscosity needs to be pumped at high flow, and/or high temperature, it is one of the only pumps that will do this safely and effectively. 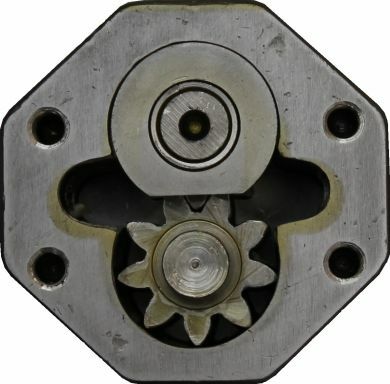 The Cast Iron version of this High Flow Gear Pump has been designed to be chemically compatible with fluids such as Vegetable Oil, Animal Fats, Motor Oil, Waste Motor Oil, Lubricating Oils and Light Greases, and other medium to high viscosity oils and other non corrosive viscous substances, this does not include oils containing any water, or emulsified water. NOTE: if this pump is used to drain oil from the bottom of a vessel, and that oil contains settled water, the pump will rust solid during rest, if there is any possibiity of the oil tank containing water, then always run the pump through with dry oil after use. IMPORTANT - Gear pumps cannot pump solid matter such as metal fragments, these will jam the gears and stop the pump, which can damage the motor or blow fuses. If you intend to use the pump for any oil with SOLID particle contamination, then you will need to install an inline filter to protect the pump, or be prepared to dismantle and unblock the pump as required. The pump can handle soft particles and will rapidly grind up soft particle matter such as food debris, fats, greases, etc. If you are likely to be pumping oil with solid particle contamination then we recommend using one of our Flexible Impeller Pumps which can handle very large solids without risking damage to the pumps impellor or motor, though flexible impeller pumps are not good for hot liquids, or pumping in high pressure or vacuum environments, in this scenario this gear pump is better. Due to the pump being a positive displacement pump, and having no internal bypass mechanism, if the outlet flow is restricted to a point where the motor power is not sufficient to turn the gears (or is completely closed off), then the motor will stop turning completely, and will overheat, leading to a blown fuse. The maximum head for this pump, we recommend is 5m, unrestricted. SPECIAL ORDER ITEM - Please email us to check current availability BEFORE purchasing, this item will need to be imported specially from the U.S.A.